Closely connected to the theme of sacrifice is the promise of resurrection. Christianity teaches that Christ was resurrected into eternal life for making the ultimate sacrifice (his death) for mankind. Near the end of A Tale of Two Cities, Carton remembers a Christian prayer: "I am the resurrection and the life." As he goes to the guillotine to sacrifice himself, Carton has a vision of his own resurrection, both in heaven and on earth through Lucie and Charles's child, named Sydney Carton, whose life fulfills the original Carton's lost potential. Yet Carton's is not the only resurrection in the novel. After having been imprisoned for years, Dr. Manette is "recalled to life" by Lucie's love. Jerry Cruncher, meanwhile, works as a "resurrection man" stealing body parts from buried corpses, but by the end of the novel he gives it up in favor of praying for a holier resurrection of his own. The ThemeTracker below shows where, and to what degree, the theme of Resurrection appears in each chapter of A Tale of Two Cities. Click or tap on any chapter to read its Summary & Analysis. Below you will find the important quotes in A Tale of Two Cities related to the theme of Resurrection. Fyfe, Paul. "A Tale of Two Cities Themes: Resurrection." LitCharts. LitCharts LLC, 22 Jul 2013. Web. 11 Jan 2019. Fyfe, Paul. "A Tale of Two Cities Themes: Resurrection." LitCharts LLC, July 22, 2013. 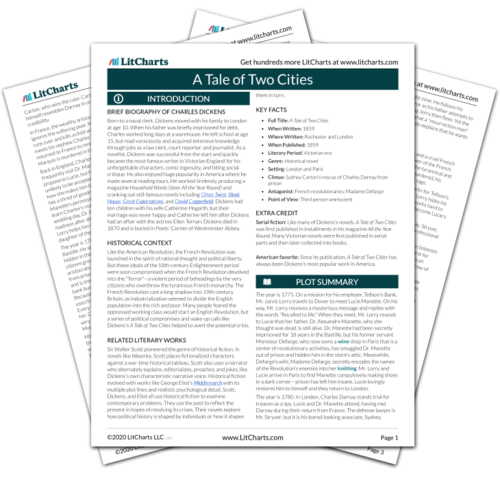 Retrieved January 11, 2019. https://www.litcharts.com/lit/a-tale-of-two-cities/themes/resurrection.